American News posted an article in defense of some recent comments by Donald Trump. American News doesn't appear to be a reliable source, and I have been unable to confirm that statistic. 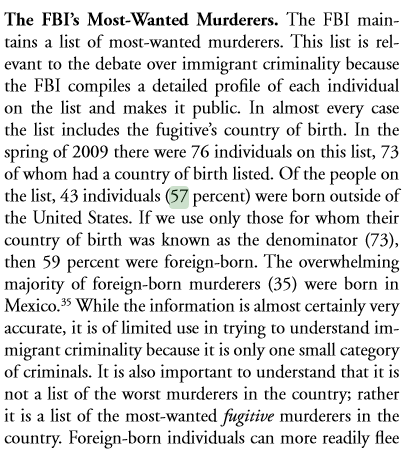 Are there studies that support the claim that the majority of fugitive murderers most wanted by the FBI are foreign-born? Additionally, how many of those fugitives were born in Mexico (and hence add some relevant evidence to support Trump's claim)? It gives the source as the FBI Most Wanted For Murders List. The CIS study further stated that an overwhelming majority (35/43) of them were Mexican. Assuming that the list has not changed significantly in composition since 2009, we can directly fact-check this list to verify this claim. A cursory sample of the wanted criminals listed shows that indeed a significant proportion of them are foreign born, and the majority are Mexican. Not the answer you're looking for? Browse other questions tagged united-states law-enforcement mexico . Are there 76 different law enforcement agencies providing officers to control the DAPL protests?